Auburn emergency department staff have worked hard to ensure our patients are treated on time. Left to right: Clinical nurse consultant Naresh Kc, registered nurses Krystal Tran and Natalie Moore, clinical nurse specialist Heather Prudence and registered nurse Jeff Deray. Patients are accessing emergency care faster in some Western Sydney hospitals, according to today’s Bureau of Health Information (BHI) Report. Westmead, Blacktown and Mount Druitt hospitals in the Western Sydney Local Health District have been listed as NSW’s three most improved sites for time to commence emergency treatment. The BHI quarterly report highlights emergency and elective surgery performance at hospitals across the state for the period October to December 2017. In that period, WSLHD hospitals looked after 47,597 patients in emergency, up 2,000 patients from the same period in 2016. WSLHD chief executive Danny O’Connor has praised all hospital staff on for their hard work to tirelessly support our community. “The time for patients to be seen continues to improve in every category in our hospitals,” Mr O’Connor said. “This is despite the large increase in patients visiting our emergency departments. 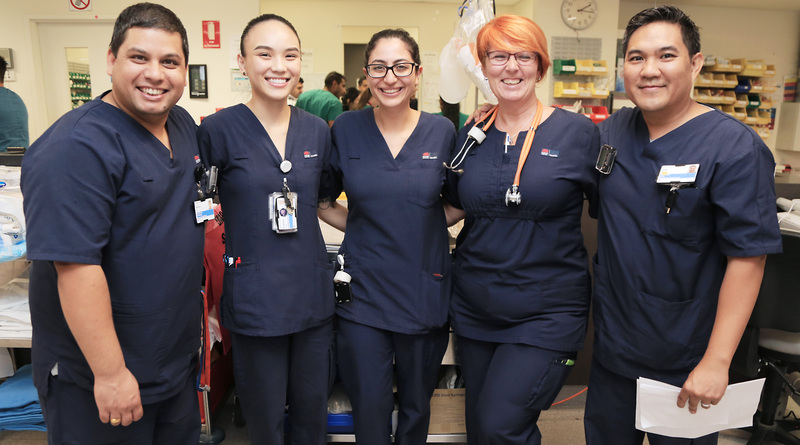 “Westmead Hospital, which has one of the busiest emergency departments in NSW, recorded the greatest improvement in the time to commence medical treatment since 2013. Auburn Hospital staff celebrate their results in today’s BHI report. WSLHD hospitals have also ensured our patients are receiving their surgery at the right time. “In all surgical categories – urgent, semi-urgent and non-urgent – our hospitals continued to perform above the required targets,” Mr O’ Connor said. “At Auburn Hospital, 100 per cent of elective surgeries were completed within clinically recommended timeframes. Westmead and Blacktown hospitals are undertaking multimillion dollar redevelopment projects that will cater to the growing population in western Sydney. Stage 1 of the $700 million plus Blacktown and Mount Druitt hospitals expansion project finished in May 2016 with the opening of the clinical services building at Blacktown Hospital and stage 2 completed at Mount Druitt today. The Westmead Redevelopment is transforming healthcare in western Sydney. The NSW Government, along with universities and the private sector, has committed more than $1 billion towards the project – the biggest health infrastructure project in NSW. WSLHD encourages patients with less urgent conditions such as minor illnesses, rashes, aches and pains to visit their GP. Patients can also phone healthdirect Australia (1800 022 222), a free telephone triage and advice line staffed by registered nurses 24 hours a day, seven days a week, every day of the year.